Tools that may be used to take a soil sample include a soil-sampling probe, an auger, or a spade. Tools should be either stainless steel or chrome-plated to avoid contamination of the sample. Preferably, collect in a clean, dry plastic container as soil may pick up zinc for example, if the container is galvanized. Areas that differ in soil texture, color, plant growth, or treatment should be sampled separately, provided the areas can be treated separately. Site-specific farming may necessitate sampling by the acre. A soil map or plant response map can be of help in distinguishing areas. Unless of specific interest, avoid dead furrows, corners of fields, end rows, and areas that are poorly drained or have had fertilizers or amendments dumped on them. Stay at least 50 feet away from barns, roads, lanes, or fence rows when sampling fields. Perennial crops may be sampled by tagging specific trees or vines and returning to the same stations each time sampling is done. Home gardens or landscape may be sampled according to area of concern. Submitting at least two samples from different areas will help determine the degree of diversity, whereas one sample will provide only an average of all conditions present. 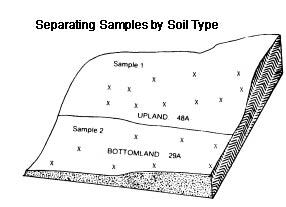 The soil sample collected should be a composite from 10 to 20 locations within a selected area; a sufficient number to "average out" variations. Sample from areas of main root development. Before collecting each subsample, scrape away surface residue then sample the top 6 inches or the depth of tillage. Deeper profiles may be sampled separately, if a concern. For example, nitrate nitrogen may be sampled at 1-foot increments down to 3 feet or more. Sodium, chloride, boron, and free lime may be more predominant deeper down. For permanent pastures and turf areas, it may be sufficient to sample only the top 3 to 4 inches. Even shallower sampling may be in order if determining water infiltration problems due to irrigation water low in salts. Mix cores or slices thoroughly in a clean plastic container, and send about a pintful (2 cups) of the composite sample to the laboratory. Submit a separate pint for nematode testing. Seek further advice for extensive testing that may require more than a pint of soil (1 gallon required for infiltration rate test). Annual sampling may be necessary to monitor residual nitrogen and problem soils. Banded areas: It takes only a trace of fertilizer to contaminate a sample. It may be wise to avoid these areas altogether when sampling. Low-volume fertigation (microirrigation): Do not sample directly below emitters. Consider sampling from around half the radius of the wetting zone. Nematode Sampling: Sample only from moist soil and always try to include feeder roots. This may be the top six inches for turf or down to three feet for many deep-rooted crops. Avoid sampling from completely dead plants. Identify each sample with numbers and/or letters, by depth for example, or good versus bad (up to five alphanumeric characters). Avoid numbering samples simply as 1,2,3, ... as it may lead to confusion later. Indicate specific analyses to be run and provide complete information on plant type and age and whether preplant or maintenance fertility guidelines/recommendations are required. Select either the standard format (five samples per page) or the graphical format (one sample per page). If samples are very wet, they should be air-dried to a workable condition before packaging. (Nematode samples are an exception. They should be kept cool and moist). Include a completed soil sample information sheet or cover letter with instructions within the same package. Processing will be delayed if sent separately. Also, include payment if you do not have an established account. Samples should be shipped by a carrier such as UPS or FEDEX, or by first class mail. Ensure that samples are not packaged loosely, as they are likely to shift around and burst open during shipping. Caution: Do not submit organic amendments or soilless nursery media as "soils". They require different testing. A & L Western Agricultural Laboratories, Inc.